Sewage treatment, or domestic wastewater treatment, is the process of removing contaminants from wastewater and household sewage, both runoff (effluents) and domestic. It includes physical, chemical and biological processes to remove physical, chemical and biological contaminants. Its objective is to produce a waste stream (or treated effluent) and a solid waste or sludge suitable for discharge or reuse back into the environment. This material is often inadvertently contaminated with many toxic organic and inorganic compounds. Sewage is created by residences, institutions, hospitals and commercial and industrial establishments. It can be treated close to where it is created (in septic tanks, biofilters or aerobic treatment systems), or collected and transported via a network of pipes and pump stations to a municipal treatment plant. Sewage collection and treatment is typically subject to local, state and federal regulations and standards. Industrial sources of wastewater often require specialized treatment processes. The sewage treatment involves three stages, called primary, secondary, and tertiary treatment. First, the solids are separated from the wastewater stream. Then, dissolved biological matter is progressively converted into a solid mass by using indigenous, water-borne micro-organisms. Finally, the biological solids are neutralized, then disposed of or re-used, and the treated water may be disinfected chemically or physically (for example by lagoons and micro-filtration). The final effluent can be discharged into a stream, river, bay, lagoon or wetland, or it can be used for the irrigation of a golf course, green way or park. If it is sufficiently clean, it can also be used for groundwater recharge or agricultural purposes. Raw influent (sewage) includes household waste liquid from toilets, baths, showers, kitchens, sinks, and so forth that is disposed of via sewers. In many areas, sewage also includes liquid waste from industry and commerce. The separation and draining of household waste into greywater and blackwater is becoming more common in the developed world, with greywater being permitted to be used for watering plants or recycled for flushing toilets. A lot of sewage also includes some surface water from roofs or hard-standing areas. Municipal wastewater therefore includes residential, commercial, and industrial liquid waste discharges, and may include stormwater runoff. Sewage systems capable of handling stormwater are known as combined systems or combined sewers. Such systems are usually avoided since they complicate and thereby reduce the efficiency of sewage treatment plants owing to their seasonality. The variability in flow also leads to often larger than necessary, and subsequently more expensive, treatment facilities. In addition, heavy storms that contribute more flows than the treatment plant can handle may overwhelm the sewage treatment system, causing a spill or overflow (called a combined sewer overflow, or CSO, in the United States). It is preferable to have a separate storm drain system for stormwater in areas that are developed with sewer systems. Chemical treatment this step is usually combined with settling and other processes to remove solids, such as filtration. The combination is referred to in the United States as physical chemical treatment. Primary treatment removes the materials that can be easily collected from the raw wastewater and disposed of. The typical materials that are removed during primary treatment include fats, oils, and greases (also referred to as FOG), sand, gravels and rocks (also referred to as grit), larger settleable solids and floating materials (such as rags and flushed feminine hygiene products). This step is done entirely with machinery. In primary treatment, the influent sewage water is strained to remove all large objects that are deposited in the sewer system, such as rags, sticks, tampons, cans, fruit, etc. This is most commonly done with a manual or automated mechanically raked bar screen. The raking action of a mechanical bar screen is typically paced according to the accumulation on the bar screens and/or flow rate. The bar screen is used because large solids can damage or clog the equipment used later in the sewage treatment plant. The solids are collected in a dumpster and later disposed in a landfill. Primary treatment also typically includes a sand or grit channel or chamber where the velocity of the incoming wastewater is carefully controlled to allow sand grit and stones to settle, while keeping the majority of the suspended organic material in the water column. This equipment is called a degritter or sand catcher. Sand, grit, and stones need to be removed early in the process to avoid damage to pumps and other equipment in the remaining treatment stages. Sometimes there is a sand washer (grit classifier) followed by a conveyor that transports the sand to a container for disposal. The contents from the sand catcher may be fed into the incinerator in a sludge processing plant, but in many cases, the sand and grit is sent to a landfill. Many plants have a sedimentation stage where the sewage is allowed to pass slowly through large tanks, commonly called "primary clarifiers" or "primary sedimentation tanks." The tanks are large enough that sludge can settle and floating material such as grease and oils can rise to the surface and be skimmed off. The main purpose of the primary clarification stage is to produce both a generally homogeneous liquid capable of being treated biologically and a sludge that can be separately treated or processed. Primary settling tanks are usually equipped with mechanically driven scrapers that continually drive the collected sludge towards a hopper in the base of the tank from where it can be pumped to further sludge treatment stages. Secondary treatment is designed to substantially degrade the biological content of the sewage such as are derived from human waste, food waste, soaps and detergent. The majority of municipal plants treat the settled sewage liquor using aerobic biological processes. For this to be effective, the biota require both oxygen and a substrate on which to live. There are a number of ways in which this is done. In all these methods, the bacteria and protozoa consume biodegradable soluble organic contaminants (e.g. sugars, fats, organic short-chain carbon molecules, etc.) and bind much of the less soluble fractions into floc. Secondary treatment systems are classified as fixed film or suspended growth. 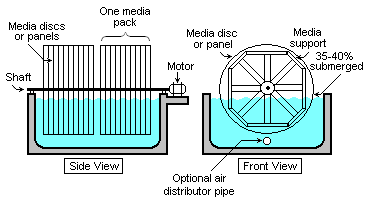 Fixed-film treatment process including trickling filter and rotating biological contactors where the biomass grows on media and the sewage passes over its surface. In suspended growth systems—such as activated sludge—the biomass is well mixed with the sewage and can be operated in a smaller space than fixed-film systems that treat the same amount of water. However, fixed-film systems are more able to cope with drastic changes in the amount of biological material and can provide higher removal rates for organic material and suspended solids than suspended growth systems. 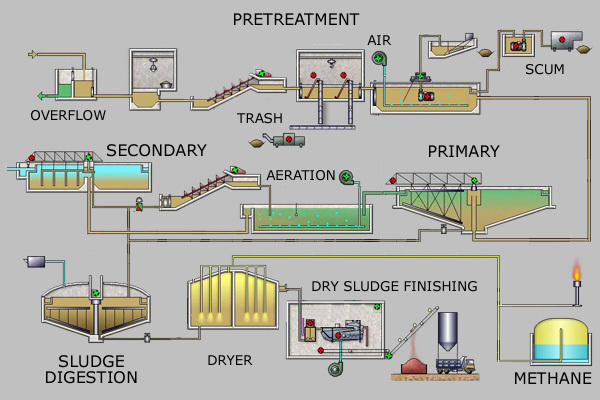 A generalized, schematic diagram of an activated sludge process. Most biological oxidation processes for treating industrial wastewaters have in common the use of oxygen (or air) and microbial action. Surface-aerated basins achieve 80 to 90 percent removal of Biochemical Oxygen Demand with retention times of 1 to 10 days. The basins may range in depth from 1.5 to 5.0 meters and use motor-driven aerators floating on the surface of the wastewater. 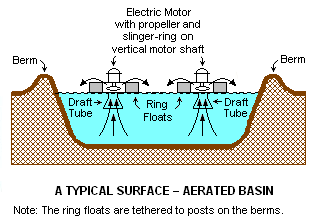 In an aerated basin system, the aerators provide two functions: they transfer air into the basins required by the biological oxidation reactions, and they provide the mixing required for dispersing the air and for contacting the reactants (that is, oxygen, wastewater and microbes). Typically, the floating surface aerators are rated to deliver the amount of air equivalent to 1.8 to 2.7 kg O2/kW•h. However, they do not provide as good mixing as is normally achieved in activated sludge systems and therefore aerated basins do not achieve the same performance level as activated sludge units. Schematic diagram of a typical rotating biological contactor (RBC). 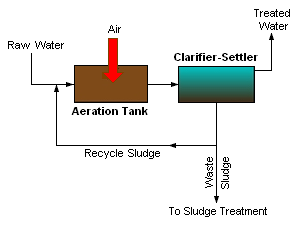 The treated effluent clarifier/settler is not included in the diagram. Rotating biological contactors (RBCs) are mechanical secondary treatment systems, which are robust and capable of withstanding surges in organic load. RBCs were first installed in Germany in 1960 and have since been developed and refined into a reliable operating unit. The rotating disks support the growth of bacteria and micro-organisms present in the sewage, which breakdown and stabilize organic pollutants. To be successful, micro-organisms need both oxygen to live and food to grow. Oxygen is obtained from the atmosphere as the disks rotate. As the micro-organisms grow, they build up on the media until they are sloughed off due to shear forces provided by the rotating discs in the sewage. Effluent from the RBC is then passed through final clarifiers where the micro-organisms in suspension settle as a sludge. 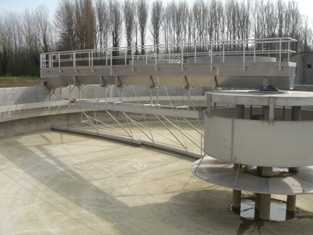 The sludge is withdrawn from the clarifier for further treatment. The purpose of tertiary treatment is to provide a final treatment stage to raise the effluent quality before it is discharged to the receiving environment (sea, river, lake, ground, etc.). More than one tertiary treatment process may be used at any treatment plant. If disinfection is practiced, it is always the final process. It is also called "effluent polishing." 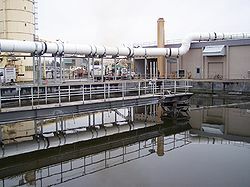 A sewage treatment plant and lagoon in Everett, Washington. Constructed wetlands include engineered reedbeds and a range of similar methodologies, all of which provide a high degree of aerobic biological improvement and can often be used instead of secondary treatment for small communities, also see phytoremediation. One example is a small reedbed used to clean the drainage from the elephants' enclosure at Chester Zoo in England. Phosphorus can be removed biologically in a process called enhanced biological phosphorus removal. In this process, specific bacteria, called polyphosphate accumulating organisms (PAOs), are selectively enriched and accumulate large quantities of phosphorus within their cells (up to 20 percent of their mass). When the biomass enriched in these bacteria is separated from the treated water, these biosolids have a high fertilizer value. Phosphorus removal can also be achieved by chemical precipitation, usually with salts of iron (e.g. ferric chloride), aluminum (e.g. alum), or lime. This may lead to excessive sludge productions as hydroxides precipitates and the added chemicals can be expensive. Despite this, chemical phosphorus removal requires significantly smaller equipment footprint than biological removal, is easier to operate and is often more reliable than biological phosphorus removal. Once removed, phosphorus, in the form of a phosphate rich sludge, may be land filled or, if in suitable condition, resold for use in fertilizer. Ultraviolet (UV) light can be used instead of chlorine, iodine, or other chemicals. Because no chemicals are used, the treated water has no adverse effect on organisms that later consume it, as may be the case with other methods. UV radiation causes damage to the genetic structure of bacteria, viruses, and other pathogens, making them incapable of reproduction. The key disadvantages of UV disinfection are the need for frequent lamp maintenance and replacement and the need for a highly treated effluent to ensure that the target microorganisms are not shielded from the UV radiation (i.e., any solids present in the treated effluent may protect microorganisms from the UV light). In the United Kingdom, light is becoming the most common means of disinfection because of the concerns about the impacts of chlorine in chlorinating residual organics in the wastewater and in chlorinating organics in the receiving water. Edmonton, Alberta, Canada also uses UV light for its water treatment. Ozone O3 is generated by passing oxygen O2 through a high voltage potential resulting in a third oxygen atom becoming attached and forming O3. Ozone is very unstable and reactive and oxidizes most organic material it comes in contact with, thereby destroying many pathogenic microorganisms. Ozone is considered to be safer than chlorine because, unlike chlorine which has to be stored on site (highly poisonous in the event of an accidental release), ozone is generated onsite as needed. Ozonation also produces fewer disinfection by-products than chlorination. A disadvantage of ozone disinfection is the high cost of the ozone generation equipment and the requirements for special operators. One type of system that combines secondary treatment and settlement is the sequencing batch reactor (SBR). Typically, activated sludge is mixed with raw incoming sewage and mixed and aerated. The resultant mixture is then allowed to settle producing a high quality effluent. The settled sludge is run off and re-aerated before a proportion is returned to the head of the works. SBR plants are now being deployed in many parts of the world including North Liberty, Iowa, and Llanasa, North Wales. The sludges accumulated in a wastewater treatment process must be treated and disposed of in a safe and effective manner. The purpose of digestion is to reduce the amount of organic matter and the number of disease-causing microorganisms present in the solids. The most common treatment options include anaerobic digestion, aerobic digestion, and composting. Aerobic digestion is a bacterial process occurring in the presence of oxygen. Under aerobic conditions, bacteria rapidly consume organic matter and convert it into carbon dioxide. The operating costs used to be characteristically much greater for aerobic digestion because of the energy used by the blowers, pumps, and motors needed to add oxygen to the process. However, recent technological advances include non-electric aerated filter systems that use natural air currents for the aeration instead of electrically operated machinery. Aerobic digestion can also be achieved by using diffuser systems or jet aerators to oxidize the sludge. The outlet of a wastewater treating plant flows into a small river. Many processes in a wastewater treatment plant are designed to mimic the natural treatment processes that occur in the environment, whether that environment is a natural water body or the ground. If not overloaded, bacteria in the environment will consume organic contaminants, although this will reduce the levels of oxygen in the water and may significantly change the overall ecology of the receiving water. Native bacterial populations feed on the organic contaminants, and the numbers of disease-causing microorganisms are reduced by natural environmental conditions such as predation exposure to ultraviolet radiation, for example. Consequently, in cases where the receiving environment provides a high level of dilution, a high degree of wastewater treatment may not be required. However, recent evidence has demonstrated that very low levels of certain contaminants in wastewater, including hormones (from animal husbandry and residue from human hormonal contraception methods) and synthetic materials such as phthalates that mimic hormones in their action, can have an unpredictable adverse impact on the natural biota and potentially on humans if the water is re-used for drinking water. In the United States and EU, uncontrolled discharges of wastewater to the environment are not permitted under law, and strict water quality requirements are to be met. A significant threat in the coming decades will be the increasing uncontrolled discharges of wastewater within rapidly developing countries. There are few reliable figures on the share of the wastewater collected in sewers that is being treated in the world. In many developing countries the bulk of domestic and industrial wastewater is discharged without any treatment or after primary treatment only. In Latin America about 15 percent of collected wastewater passes through treatment plants (with varying levels of actual treatment). In Venezuela, a below average country in South America with respect to wastewater treatment, 97 percent of the country’s sewage is discharged raw into the environment. In a relatively developed Middle Eastern country such as Iran, Tehran's majority of population has totally untreated sewage injected to the city’s groundwater. Israel has also aggressively pursued the use of treated sewer water for irrigation. In 2008, agriculture in Israel consumed 500 million cubic meters of potable water and an equal amount of treated sewer water. The country plans to provide a further 200 million cubic meters of recycled sewer water and build more desalination plants to supply even more water. Water utilities in developing countries are chronically underfunded because of low water tariffs, the nonexistence of sanitation tariffs in many cases, low billing efficiency (i.e. many users that are billed do not pay) and poor operational efficiency (i.e. there are overly high levels of staff, there are high physical losses, and many users have illegal connections and are thus not being billed). In addition, wastewater treatment typically is the process within the utility that receives the least attention, partly because enforcement of environmental standards is poor. As a result of all these factors, operation and maintenance of many wastewater treatment plants is poor. This is evidenced by the frequent breakdown of equipment, shutdown of electrically operated equipment due to power outages or to reduce costs, and sedimentation due to lack of sludge removal. Developing countries as diverse as Egypt, Algeria, China or Colombia have invested substantial sums in wastewater treatment without achieving a significant impact in terms of environmental improvement. Even if wastewater treatment plants are properly operating, it can be argued that the environmental impact is limited in cases where the assimilative capacity of the receiving waters (ocean with strong currents or large rivers) is high, as it is often the case. Waterborne diseases that are prevalent in developing countries, such as typhus and cholera, are caused primarily by poor hygiene practices and the absence of improved household sanitation facilities. The public health impact of the discharge of untreated wastewater is comparatively much lower. Hygiene promotion, on-site sanitation and low-cost sanitation thus are likely to have a much greater impact on public health than wastewater treatment. ↑ 1.0 1.1 1.2 1.3 M.R. Beychok, 1971, Performance of surface-aerated basins. Chemical Engineering Progress Symposium Series. 67(107):322–339. Retrieved February 18, 2009. ↑ Complete Biosolids Management. New England Fertilizer Co. Retrieved February 25, 2009. ↑ 1998. 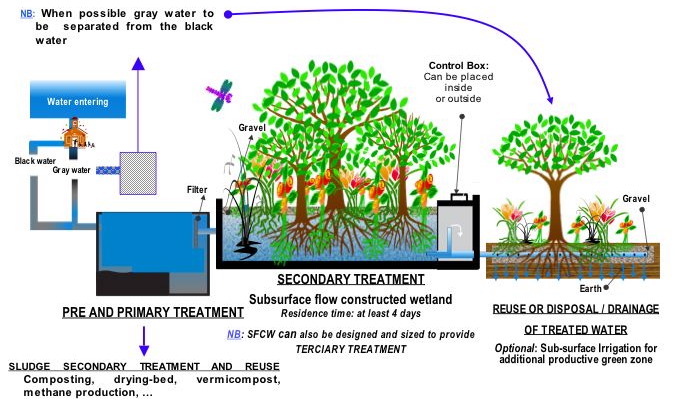 Appropriate Technology for Sewage Pollution Control in the Wider Caribbean Region. Caribbean Environment Programme Technical Report #40. ↑ Israel uses both desalinated sea water and recycled sewer water for agriculture. International Herald Tribune. Retrieved February 18, 2009. Drinan, Joanne E. Water and Wastewater Treatment: A Guide for the Nonengineering Professionals. Boca Raton, FL: Lewis Publishers, 2000. ISBN 1587160498. Droste, Ronald L. Theory and Practice of Water and Wastewater Treatment. New York, NY: J. Wiley, 1997. ISBN 0471124443. Spellman, Frank R. Handbook of Water and Wastewater Treatment Plant Operations, Second ed. Boca Raton, FL: CRC Press/Taylor & Francis, 2009. ISBN 1420075306. Waste Water Treatment - From TheWaterTreatments.com. Aerated Lagoons for Wastewater Treatment - Maine Lagoons Task Force. The Straight Dope - What happens to all the stuff that goes down the toilet? - Syndicated column by Cecil Adams. Tour of a Washington state sewage plant written by an employee. This page was last modified on 9 September 2015, at 15:43.